Night-vision goggles and remote control vehicles are nice but they don't have anything on this: A limited-edition Call of Duty Jeep being rolled out by Chrysler. Collectors editions have grown increasingly popular over the years, and increasingly expensive in some cases. Art books and "making of" bonus discs are standard equipment, while more sophisticated examples toss in statuettes, cloth maps and, for the more discerning and deep-pocketed gamer, stuff like the aforementioned night vision goggles and RC toys. But now it's time to separate the men from the boys with nothing less than a real, live Call of Duty-themed Jeep Wrangler. 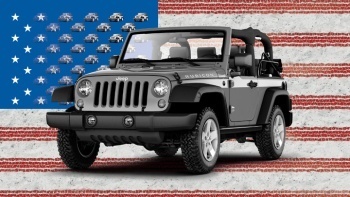 The famous Wrangler will be the "hero vehicle" in the upcoming Call of Duty: Black Ops and to take advantage of that, Chrysler and Activision have teamed up to create a limited edition Jeep inspired by the game. There's no word yet on how it will be tricked out, what it will cost or whether it will come with a copy of Activision's new shooter, but base Wrangler models run from $21,695 for the Sport to $28,775 for the Rubicon. I'm not sure if this is awesome or ridiculous (I suspect it's a good measure of both) but either way, it's an interesting counterpoint to Activision CEO Bobby Kotick's recent statement that the publisher won't take advantage of in-game advertising unless it's "really authentic and will enhance the game experience." I suppose this qualifies; the Jeep, after all, is far and away the most famous and instantly recognizable vehicle in the history of the U.S. military. Call of Duty: Black Ops comes out on November 9 for the PC, PlayStation 3, Xbox 360 and Wii.